A Photo is viral showing an old man holding a brick in his hand, standing in front of a policeman with gun in his hand. Look at the farmer with a brick in his hand, facing a cop with a gun. 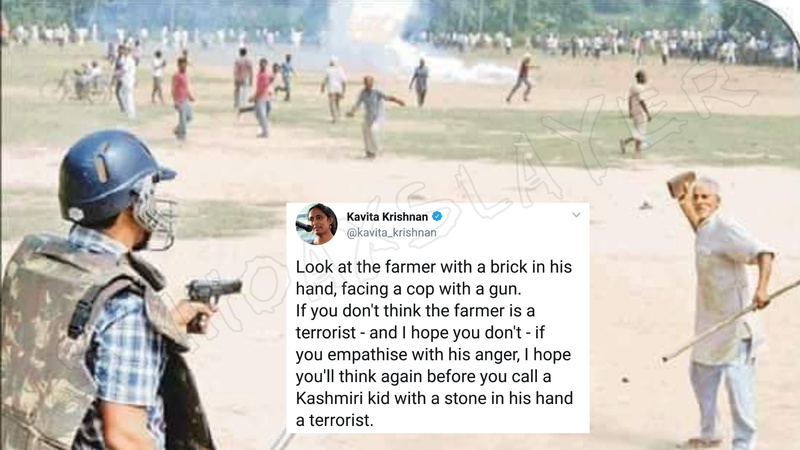 If you don’t think the farmer is a terrorist – and I hope you don’t – if you empathise with his anger, I hope you’ll think again before you call a Kashmiri kid with a stone in his hand a terrorist. She claimed the elder men as a farmer relating it to recent Farmer Protests. Secretary (Home) Kamal Saksena said the mahapanchayat had been called by Som’s wife and his brother. Apart from banning it on Friday, the district administration late Saturday night had also managed to persuade Som to appeal from the Orai jail to his supporters to postpone the mahapanchayat by a week. Following this, the organisers too assured the police and paramilitary forces stationed there that they were not going ahead with their programme. But the message did not apparently reach the 24 villages, dominated by Thakurs, Som’s community, as by then people had started gathering at the venue. By 11 am on Sunday, a huge crowd had gathered at the spot, and the villagers decided to go ahead and hold the mahapanchayat. They reiterated their demands for withdrawal of NSA on Som and immediate release of hundreds of “innocents” arrested for the riots. I'm informed that this pic below isn't from the Kisan Yatra but from 2013 Jat Mahapanchayat in Meerut. ← Did Rajiv and Sonia marry according to Christian customs ? December 1, 2018 Hoax Slayer Comments Off on Randeep Surjewala targets Vasundhra Raje based on a trimmed clip.